Some of the prominent participants operating in the global active protection systems market are SAAB AB, The Raytheon Company, Airbus Group, KONSTRUKTORSKOYE BYURO MASHYNOSTROYENIYA, Rafael Advanced Defense Systems Ltd., Rheinmetall AG, Safran Electronics & Defence, Aselsan A.S., Artis, LLC, and Israel Military Industries. 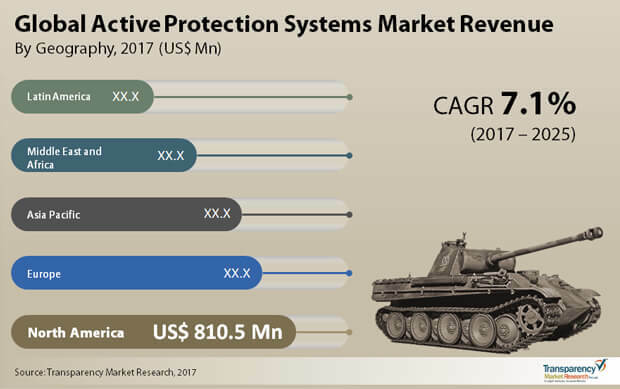 As per a report by Transparency Market Research, the global active protection systems market is slated to expand at a healthy CAGR of 7.1% between 2017 and 2025 to become worth US$5.253 bn by 2025 from US$2.847 bn in 2016. Depending upon the types of systems, the global active protection systems market can be divided into infrared decoy, radar decoy, directed energy, electro-optics jammers, light weapon defense, and rocket/missile based, among others. Of them, the radar decoy segment leads the market with maximum share and is trailed by infrared decoy segment. The others segment, consisting of DROZD active protection system, LEDS active protection system, iron curtain active protection system, iron fist active protection system, and ZASLON active protection system is also predicted to clock good growth in the years to come. Geographically, the key segments of the global active protection systems market are North America, Latin America, Asia Pacific, Europe, and the Middle East and Africa. At present, North America is a dominant market and accounts for maximum market share. In 2016, the region’s share came to around 26.8%. Supplanting of old technology with new advanced technology and growing automation in defense are predicted to be the two major growth drivers in the North America in the next couple of years. “Active Protection System (APS) can shoot down and interrupt different number of threats such as anti-tank missiles and rocket-propelled grenades with accuracy with minimum collateral damage. Active Protection System (APS) can also provide protection from these threats in various mission applications, such as fixed sites, ships and combat vehicles among others,” elaborates the lead analyst of TMR report. Majorly fuelling the global for active protection systems market is the strong demand for land based defense system such as air and missile defense. Driving the demand for two, in turn, is the strategic system and long range in conventional targets and ballistic missile. Further, increasing demand for ballistic missile defense system will be another factor slated to boost the market in the next couple of years. “The collective efforts from the United States and South Korean government to grow the land based air and missile defense in South Korea is boosting the demand of active protection systems market. Likewise, India and China’s increasing thrust on bolstering missile defense systems is also anticipated to drive the active protection system market,” adds the lead analyst of the report. Naval, land, and airborne are the various product types of the active protection system market. Among them, land segment is the major market for active protection system on account of the rising threats from terrorist and cyber-attacks.